Just like with any appliance, taking proper care of your refrigerator will help it last longer. Additionally, a good maintenance routine can also help you save money by lowering your unit’s energy consumption. If you want to keep your refrigerator running efficiently for a long time, make sure not to fall trap to these common myths. An annual cleaning is sufficient for your refrigerator. Most people only take the time to clean their refrigerators once or twice per year, thinking that it is enough. The truth is, you should clean out your fridge on a monthly basis. This helps you stay up to date on throwing away expired foods, which your refrigerator is (unnecessarily) using energy to keep cold. You only need to clean the inside of the fridge. When most people think of maintaining their refrigerator, they are thinking about the bacteria and cleanliness of the inside. 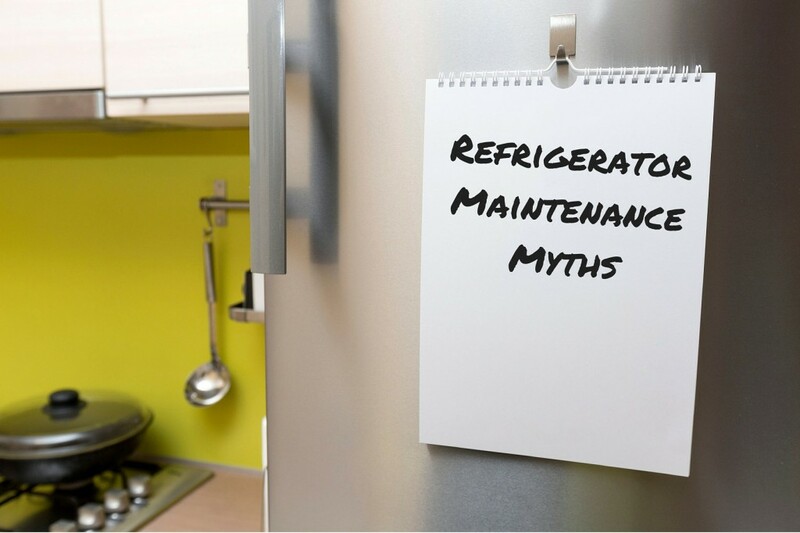 The truth is, the most important maintenance you can do is actually located on the appliance’s exterior. Clean the condenser coils, located on the back of the unit, every six months using your vacuum’s brush attachment. Keeping a second refrigerator in the garage is a good idea. Many homes across the country utilize a second refrigerator for storing beer or extra food. While this isn’t a problem, keeping it in an unfinished area is. If your second refrigerator is in an unconditioned garage or basement, it could be working twice as hard to keep cool during the hot summer months. If it is an old, inefficient refrigerator, you are doubling-down on increased energy consumption and wear-and-tear. The water filter doesn’t need to be changed. This myth doesn’t pertain to the health of your refrigerator, but rather to your personal health and hygiene. If your refrigerator has a built-in water dispenser, you should replace the filter at least twice per year to keep your water clean and clear of contaminants. Refer to your owner’s manual for instructions on how to do this. Bad maintenance habits almost always lead to breakdowns. If this happens to your refrigerator, the experts at Speedy Refrigerator Service can get you up-and-running in a matter of hours. We guarantee one-hour service to Long Island and New York City, and complete most repairs within the comfort of your own home. Call us anytime to schedule your same-day appointment at 866-782-9376.